You never know who that guy playing music on the sidewalk might be! 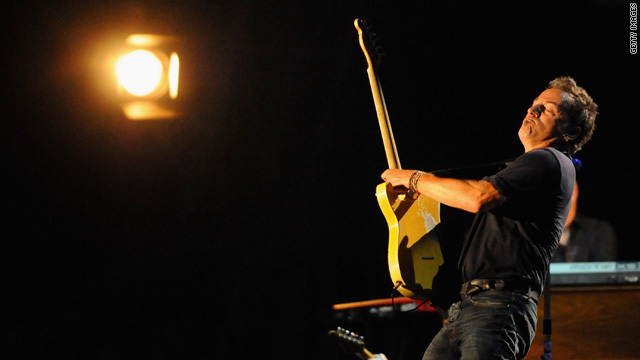 Bruce Springsteen has been spotted busking in Boston, reports the Boston Globe. It seems that Springsteen and wife Patti Scialfa were dropping their son off at Boston College last week. While in town, they dropped by the Public Gardens on Thursday and listened to street musician David Gonzalez play the Spanish guitar. The couple quickly left after attracting attention, but returned to hear more. “About 30 minutes later, he came back and we had a long conversation,” Gonzalez said. The Argentine-born guitarist told The Boss he tried to see him in concert once, but didn’t have the money. As he was leaving, The Boss tossed a tip into the musician's guitar case. “He said, ‘This is for that trip you never made,’’’ Gonzalez shared. What a sweetheart, that Bruce. Next entry »Did Bravo handle Russell Armstrong’s suicide the right way? notafan, even Reagan said he used to like Springsteen. Guys who like Springsteen tend to be somewhat "gay". They would probably s his d if they had the chance. Notafan...you are obviously looking for attention so here it is. As a straight male, who holds politically incorrect opinions of gays, yet does not let this hinder his work or friendships...I'm sure there are some gay fans for Bruce. Hate to break it to you...it crosses all music lines...from the obvious (Cher, ?Lady? Gaga) to Sahikira, Rihanna, and more. You can pretty much name any group, and they will have a portion of gay fans (boy bands, girl bands, rappers [Nikki Minaj], etc). So your message was a non-valued one. With the exception of your new education. I hate Springsteen, but I LOVE poo! Big Boss fan. Good guy and good for him. Now if only he'd stop selling everything he can put his name on...stay classy Bruce. Sorry if you think my music is void of any message. While I have an completely different style than Mr. Springsteen, if you actually listen to my lyrics or google the meaning of "How to Love". You can also google the lyrics if my delivery is to quick for you to understand. Although I appreciate them, but would still do my work without them, theres a reason I am up for 18 nominations and my closest fellow artists are up for 8. Bruce sings for his streets, I draw from mine. Do we say that we shouldn't listen to Clarence Clemon's if he is only playing the sax, because there is no message? No we listen because of the talent and emotion this amazing man brought to Bruce's band and the world itself. Choose your reasons to explain not appreciating an artist correctly. My wife always said she was going to marry Bruce....until she married me ! The Boss is great. A life long fan of not only his music but him as a person. He does these types of things all the time. A good Boss has character. Bruce Springsteen has a lot of character. Wonder if he still dances in the dark ? neat story.... loves the Boss! Give something back at no charge. Fans appreciate it. cool gesture. seems okay, not really into Bruce, though. not gonna say anything mean, just there are other artists I like better. my choice. @lynette why so surprised? anyways yea the boss is definitely one of my favorite artist, hope to catch one of his shows sometime.. Absolutely, the Boss. Great musical, spirit and plain old fun in concert. Impossible to buy a better time. First time I saw him was on the Born in the USA tour. Can't imagine what a difference it will make without the Big Man. bruce always will be the 'boss'. i've seen him 12 times over his career. each show different from the rest. i admire his love for his fans. one time in atl he asked people to bring cans of food for the food bank. so much was donated in his honor. a wonderful humanatarian whose words and music always amazes me. bruce is cool for that one..wassup all.. I like musicians who "get it".. Springsteen is one of the few that "gets it". Well done. The older Bruce gets, the better he sounds. One more reason he's The Boss. Have enuf bosses; don't need one more. Ive seen Springsteen twice and you couldnt ask for a better show! Byrd, it's sad when children are allowed to play on their parents' computer. Go to bed now, and let the adults have a conversation. What I've always loved about Springsteen is his compassion. He sets up a donation pot at every venue so people can give to their local charities, to which he also contributes. He donates millions per year to charity, quietly – you never hear about it – plus he gives dozens of free concerts on behalf of various causes. At every concert I've attended (20) he has set aside a block of tickets to give away to those who came hoping to buy tickets at the gate. But one of the most amazing things I saw his guys do was at a concert I attended in Tacoma, WA. I was sitting next to an extremely drunk guy who I thought was going to fall down the stairs, he was that out of it. A guy from the show came, took him by the arm, and as I watched, he took him to a safe seaat on the floor of the Dome where, if he fell, he wouldn't fall so far. I couldn't believe it – but we saw it happen with several other drunks, too. Amazing. Long weekends always make me FIRSTY!!!!!! !